You only have 3 more opportunities to see Maiden Phoenix Theatre Company’s production of Shakespeare’s The Winter’s Tale: this afternoon, August 29th, at 6PM, and tomorrow August 30th at 2PM and 6PM. The production is directed by Sarah Gazdowicz, and features a stellar all-female cast of some of best actors currently working in the Boston fringe. Call me biased, but I’m starting to think The Winter’s Tale should ALWAYS be all-female; I say this having myself performed in an all-female production back in 2014. The Winter’s Tale is a play of terrible mistakes, bold decisions, miraculous salvation, of buried and gratified hopes. Leontes, the king of Sicilia, accuses his pregnant wife Hermione of committing adultery with his best friend Polixenes, the King of Bohemia. A grave mistake turns into a fatal and fateful one: Polixenes and Leontes’ chief advisor Camillo flee in time to escape the king’s wrath, but Hermione is put on trial, her son Mamilius pays the price for Leontes’ defiance of the oracle of Apollo (who declares Hermione’s innocence), and the newborn baby of the ill-fated queen is cast out into the wilderness. I don’t want to spoil how it all somehow turns out OK(ish) in the end, but TWT lives somewhere between comedy and tragedy in the Shakespeare canon, and plenty of wonders are in store for the audience. Some of my favorite Boston actors are strutting their stuff out at Nathan Tufts Park in Somerville. Leontes is played by Juliet Bowler. I’ve seen her play a smooth and scary cop in McDonagh’s The Pillowman and a loyal friend in Dietz’s Rocketman, and most recently I saw her in the excellent Argos Productions’ Bully Dance, by David Valdes Greenwood. Her Leontes is severe in his rage and shattering in his recognition of his devastating actions. Polixenes is played by Kamela Dolinova, who I gushed about in Flat Earth Theatre’s fantastic Terra Nova. I greatly admired the gravity and quick temper of this King of Bohemia, and the family tensions between him and his son, Florizel. Florizel was played by a versatile Caroline Rose Markham, who previously impressed me in Fresh Ink Theatre’s production of Chalk. Markham nimbly switched from the budding prince Mamilius to the passionate prince of Bohemia. It was heartbreaking to see one prince live on in a way the other could not. All of the actresses were fabulous. I give a special shout out to Sarah Mass’s Elvis-like, ne’er-do-well rogue Autolycus (who swigged from my water bottle in his opening scene, and who had me in stitches as he struggled with a sagging fake beard, snatched from Mara Elisa Palma’s steadfast Camillo) and to April Singley’s hugely entertaining shepherd (metamorphosed from the bear-breakfast-Antigonus). I cannot wait to see more from Cassandra Meyer: her stately Hermione managed to make regality rapturous, and I almost cried when she collapsed in tears at the end of Act 1. Gail Shalan’s strong Paulina was only matched by her hilarious combative antics with Allison Gilman’s Dorcas in Act 2. Their humorousness were well-balanced by Leilani Ricardo’s serene yet vivacious Perdita. If you enjoy the physicality and choreography in this play, you have the inimitable Kiki Samko to thank (get excited about the bear at the end of Act 1, who I believe is quite ursine). Samko is known for her excellent movement work; she stole the show in imaginary beasts’ Winter Panto Kerplop!. I could go on about the creative staging, excellent pacing, creative costumes (by Norma Heller with Andrea DiTull), great directing and stage management (by Elizabeth Ramirez) behind the show, but that would probably make you late to this evening’s production. 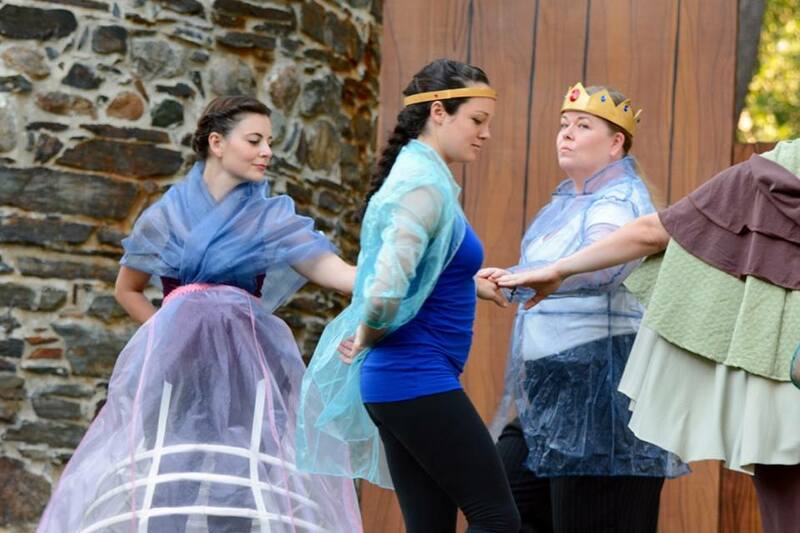 Go forth and enjoy one of the Bard’s greatest works while Boston’s nice weather is still hanging around. This entry was posted in Shakespeare, Theatre and tagged Allison Gilman, Andrea DiTull, April Singley, Argos Productions, Caroline Rose Markham, Cassandra Meyer, David Valdes Greenwood, Elizabeth Ramirez, Flat Earth Theatre, Fresh Ink Theatre, Gail Shalan, imaginary beasts, Juliet Bowler, Kamela Dolinova, Kiki Samko, Leilani Ricardo, Maiden Phoenix Theatre Company, Mara Elisa Palma, Norma Heller, Sarah Gazdowicz, Sarah Mass, The Winter's Tale. Bookmark the permalink.